tails and cream. . HD Wallpaper and background images in the Cream the Rabbit club. Sally:Ooh I got a message! Computer: You've got mail! Message says: SALLY YOU ARE A @%#$^&#&$*$^&#*&*$*^$%$$@ AND I @%&*$# HATE U!!!!!!!!!! like the legrands of zelda! AWWWWWWWWWWWW!!!! Thanks! You know me and Tails did go out this holloween as Zelda and Link! It's true! 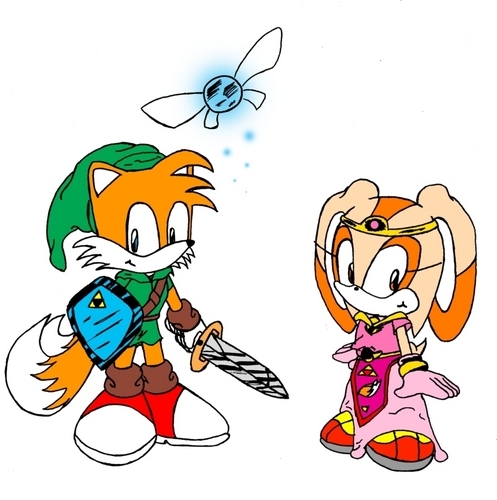 I like playing "Zelda" with Tails. We decided that we'll go as "Link" and "Zelda" for Holloween this year!